It's Milani Monday over here at Princess Polish and I have the six new LE Textured Creams collection for you today! The Textured Creams collection consists of six dramatic, fall-inspired cream nail lacquers with a textured, matte finish. They are similar in texture to the Texture Collection released this past March. First up is Lovely Lavender, a dusty lavender creme. The above is with just one coat! Next is Mystery Mauve, a pinkish brown shade. This one was with two coats, but they were thin and dried fast. Gracious Green is next up and it's a milky army green. This shade only needed one coat, but had a tiny little clump in it that you can see on the ring finger. Though, I didn't see any more in the bottle or on the brush. It was probably just a fluke. And here is Velvety Violet, a grape shade. This one took only one coat, too. Here is Charming Carmine, a rich crimson. This is my favorite of the collection for its vibrancy and uniqueness. Only one coat required again! 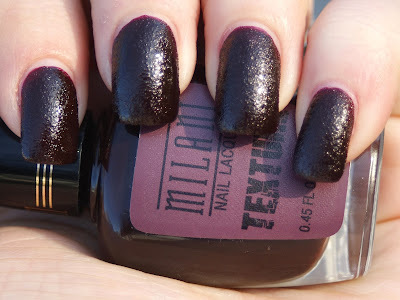 Last, but certainly not least, is Beautiful Bordeaux, a blackened maroon shade. It is very unique and needed two thin coats. Overall, this was a great collection. The texture showed up on the nail at first stroke and dried super quick. Most of them took only one coat to achieve opacity and even the ones that needed two only needed thin coats. This collection was a MAJOR win for me. The Texture Creams are currently available at HEB, Meyer, and any other retail outlets at which Milani Cosmetics are sold. 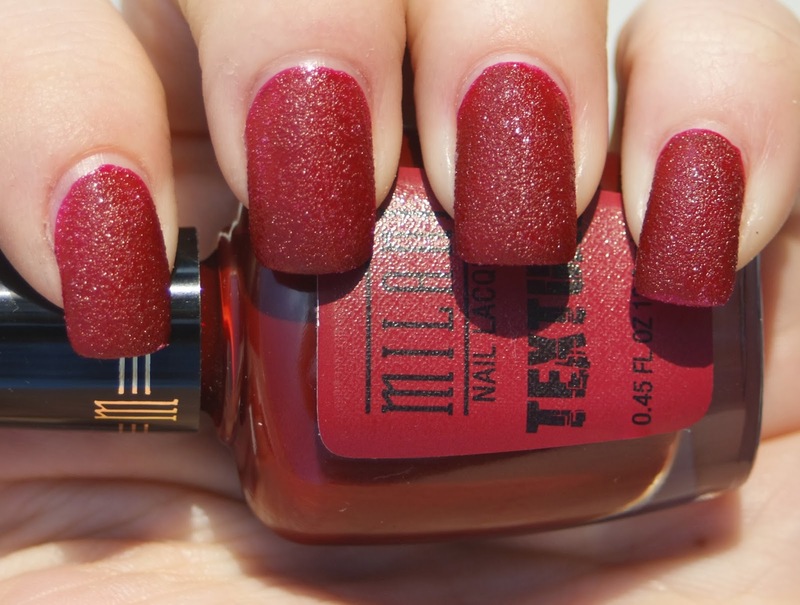 Additionally, you can check out and purchase these shades on the Milani Website. The polishes retail for $4.99 each. What did you think of these textures? I love how subtle these are for textured polishes! These are actually much more beautiful than the other textured polishes I've seen! I really like the shades in this collection! Great textured polishes for fall!